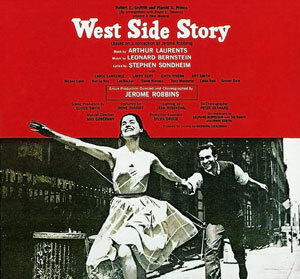 West Side Story (http://en NULL.wikipedia NULL.org/wiki/West_Side_Story_%28film%29) is an American musical with a book by Arthur Laurents (http://en NULL.wikipedia NULL.org/wiki/Arthur_Laurents), music by Leonard Bernstein (http://en NULL.wikipedia NULL.org/wiki/Leonard_Bernstein), and lyrics by Stephen Sondheim (http://en NULL.wikipedia NULL.org/wiki/Stephen_Sondheim). The musical’s plot and story is based on William Shakespeare’s Romeo and Juliet. The original Broadway (http://en NULL.wikipedia NULL.org/wiki/Broadway_theatre) production opened in 1957. Set in New York City in the mid-1950s, the musical explores the rivalry between the Jets and the Sharks (http://en NULL.wikipedia NULL.org/wiki/West_Side_Story), two teenage street gangs (http://en NULL.wikipedia NULL.org/wiki/Gang) of different ethnic and cultural backgrounds. The members of the Sharks are first-generation Americans from Puerto Rico (http://en NULL.wikipedia NULL.org/wiki/Puerto_Rico) taunted by the Jets, a working-class white group who consider themselves the true Americans. The young protagonist, Tony, one of the Jets, falls in love with Maria, the sister of Bernardo, the leader of the Sharks. The dark theme, sophisticated music, extended dance scenes, and focus on social problems marked a turning point in American musical theatre.